I had no intention of going to Minneapolis. It wasn’t because I specifically didn’t want to go there I just had never thought of it as an option. When I set out on this journey Sara Dean, one of the pro’s on my support team notified her clients of my blog through her newsletter. One of her clients forwarded my blog to her friend, Anna Dvorak who reached out to me and invited me to her home in Minneapolis. Who is this lady Anna and was she a serial killer was one of my first thoughts. I know that sounds dramatic but this was my first invite from a stranger and a girl can’t be too careful when traveling! It turns out that Anna is the furthest thing from a serial killer, she actually has made it her life’s purpose to help people live healthy, thus actually prolonging their life. My first night in town Anna invited me to have dinner at the home she shares with her husband Chris. One of the things that I have been excited to do on this trip is to break bread with people, learn from what they put on their table and that night was a great lesson in how to eat. We dined on a make your own salad of sorts complete with salad greens, quinoa, beans, cilantro, roasted corn, cucumber, red pepper, shredded carrots, sunflower seeds, salsa verde and a picco de gallo, this combination was amazing and something I would have thrown quite a bit of money down for in a restaurant. It was so exciting to know that I was nourishing my body while enjoying the food that I was eating. I never once felt deprived, never once yearned for bread, cheese or salad dressing which is not a normal occurrence in my diet. I was truly inspired by my dinner with Anna and Chris, the conversation and food were amazing and I left inspired. Anna is putting her love and knowledge of food and nutrition to good use in her three Nourish e-cookbooks. Each of her cookbooks focus on healthy yet flavorful foods that are geared towards those with food sensitivity, they all are 100% refined sugar free and mostly gluten and dairy free. Currently she is testing every recipe with a handful of people of all cooking levels to ensure the instructions are written clearly and easy to follow. Her fourth cookbook is titled Fall which will complete the seasons when it joins Winter, Spring & Summer. I am so excited to have Anna as part of my team and will look to her for guidance and inspiration when it comes to my diet, something that I desperately need. I hope to learn the skills to properly nourish myself on the road and can’t wait to increase my cooking skills for all of the amazing dinner parties I plan to host when I am settled back in to my daily life. It will be good to be known for a tasty and healthy meal or two as opposed to just specialty cocktails and jello shots as my friends know me now. 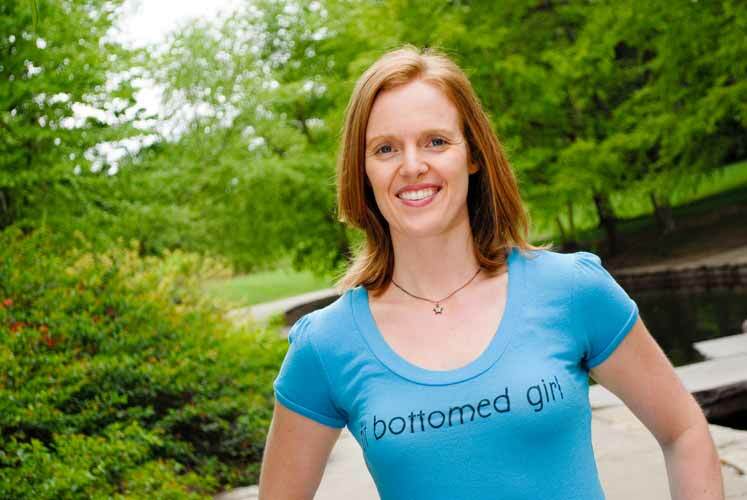 Sometimes you meet someone and it seems as if you have known them for years, conversation is fun and easy and you feel as if you have an instant friend, enter Jenn Walters co-founder of Fit Bottomed Girls. I have followed Fit Bottomed Girls for awhile and out of pure luck I checked the bios on their website to see if my path may cross with either of the founders. I was in luck, Jenn was from Kansas City, MO which was smack dab in the middle of my path. I reached out to her to see if she would be open to meeting me and she responded immediately with an invitation to join her for a yoga class and lunch. It brings me so much joy to have so many people respond to my journey in such a warm and positive manner. We met for a 10:00am Yoga Flow class that was being held in the basement of the Unity Temple located in the Plaza in Kansas City. I had purchased my own yoga mat for working out in hotels etc and was excited to roll it out for its inaugural yoga session. When it came to yoga I was essentially as new as my mat having only tried it once in my life. I have noticed that since working out regularly I have become more flexible so I had high hopes for this class. It seems that everything I do is a lesson in humility, the picture I had in my mind had me doing graceful yoga movements while reality had my sweaty wet palms sliding all over my mat. Looking around I seemed to be the only person who was struggling in this manner, I didn’t know if it was my precious Pacific Northwest reaction to the heat or if I all of a sudden started crying from the center of my hands. The instructor placed a heavy wool blanket in front of me to help me from my slip and slide however it did little to help. I survived the rest of the class without drawing too much more attention to my sweaty challenges and vowed NEVER to attempt hot yoga. I am currently in R&D to create a velcro yoga mat and gloves combo. Jenn and I dropped our mats in our cars and walked to lunch at Jack Stack Barbeque where she introduced me to true Kansas City BBQ with a burnt ends lunch. The food was great but the conversation was even better. I was able to chat with Jenn about the path she took to becoming a fitness blogger and the success and growth of Fit Bottomed Girls. In addition to blogging about all things fitness on Fit Bottomed Girls they also have two sister sites Fit Bottomed Mamas, catering to women juggling the stresses of parenthood and Fit Bottomed Eats, the tag line says it all “Being a foodie with a fit booty”. I left Jenn not only feeling as if I had made a new friend but also feeling inspired. It is so wonderful to see the successes of women who are working hard to create an online business and community which is benefitting so many people. In a glorious turn of events some of my good friends happened to be in Denver the same weekend as me! 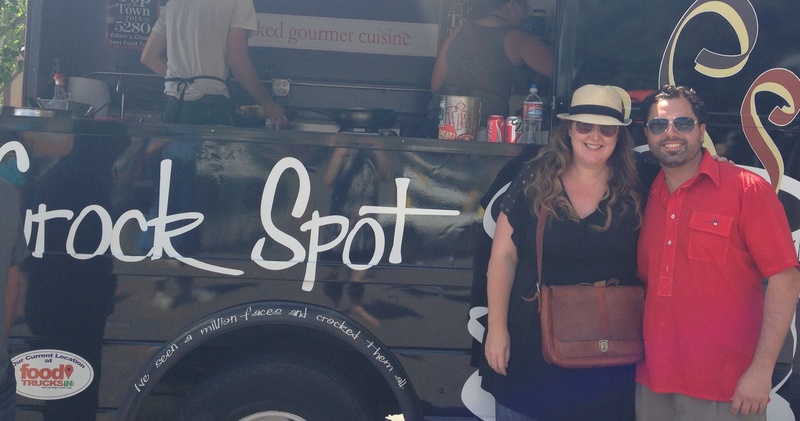 They were in town for a wedding but also had plans to attend the Snack Attack Food Truck Challenge. Their friends who were originally from Sandpoint, ID owned and operated The Crock Spot which serves healthy and if I am to be the judge, very tasty cuisine. 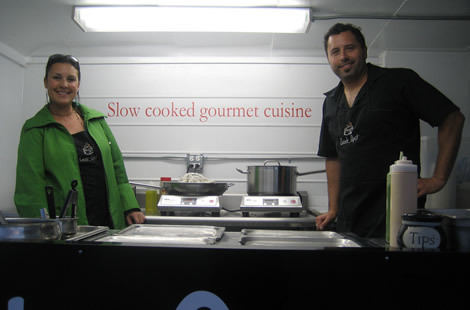 The Owners, Stephen and Mandy spent eight months perfecting their fare using meats slow roasted in crock pots and mixed with various grains and sauces. They launched their business first at Colorado Fresh Markets in 2010 and by 2011 they were mobile delivering their food all across the Denver area. 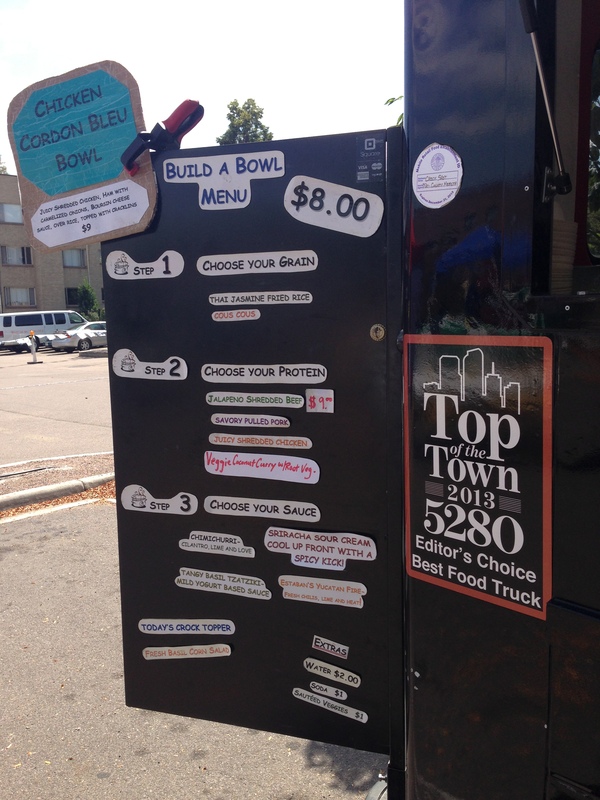 They rose to the top of the “food truck chain” when they were awarded the Editors Choice for the Best Food Truck by Denver’s 5280 Magazine as well as chosen by The Food Truck Network as America’s Favorite Food Truck. I approached the counter and placed my order which consisted of a scoop of pearled barley, jalapeno shredded beef, chimichurri sauce and a hit of sriracha sour cream all served atop one another in a bowl. I have never been a fan of traditional crock pot fare but my wariness disappeared after the first bite. The combination of flavors were amazing, the meat was tender and the grain filling. This meal was a far cry from the traditional meat and potatoes I had tasted from other crock pots in my past. 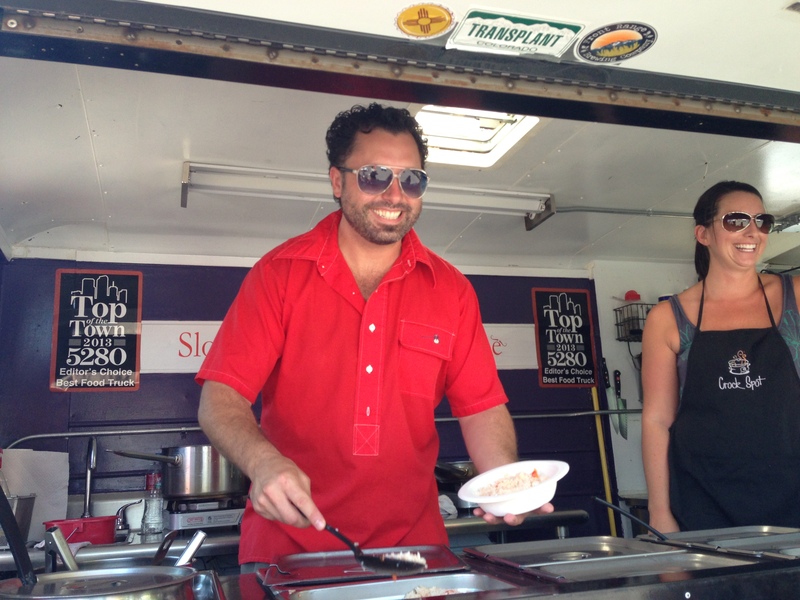 In addition to the amazing food, the staff provides a fun and engaging experience. I loitered in front of the truck for quite some time before I finally took the hint and hit the road, kidding, they were so kind they would have let me stay all day which I considered or at least until dinnertime. Are You Aware of Ayurveda? I am severely behind on my posts, partially I blame Ayurveda. There have been plenty of times in my life where I learn something new, sometimes I get it right away, other times I sit there stunned as if I had been hit on the head…count my introduction to Ayurveda as part of the latter. I am slowing caging the birds flying around my head and getting a grasp on this practice but the process has been v….e…..r…..y slow. 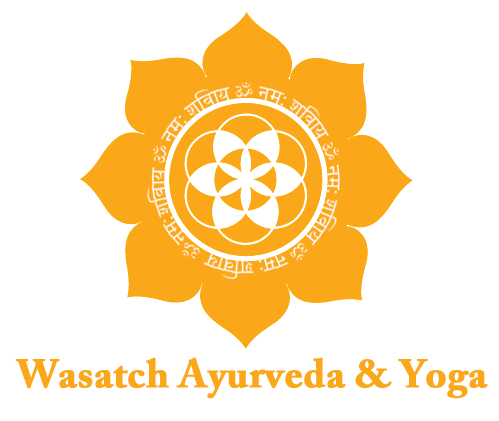 A good friend of mine told me about Tim Lewis who practiced in Salt Lake City at Yoga Upstairs through Wasatch Ayurveda. I will be the first to admit that I did not do my homework prior to arriving. I assumed that we would be doing Ayurveda, a form of yoga. I arrived at the studio expecting to humiliate myself with my lack of balance but was met with a sort of counseling session instead. 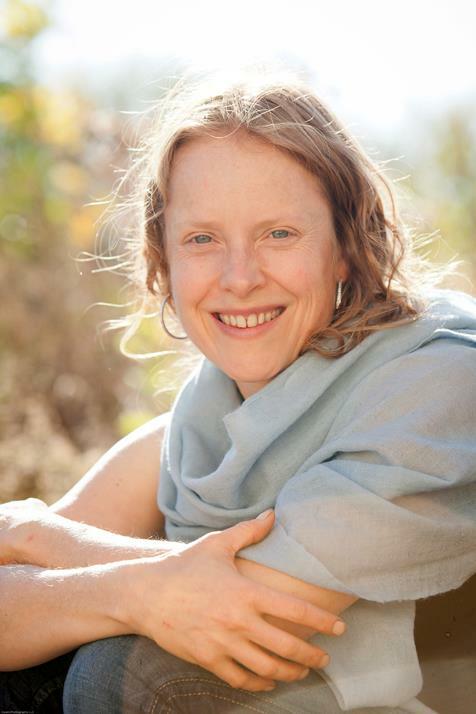 Tim motioned me to sit in a chair across from his, he had a very calming and quiet disposition about him, with his legs crossed in his office chair he began to tell me about Ayurveda and how he came to practice and teach. In his early 20s he was on a destructive path, involved in drugs and living an unhealthy life. He found that Ayurveda gave him the tools and awareness to find more stability and peace. A brief description of Ayurveda is a form of alternative medicine with the ultimate goal of healing imbalances. Many times, the root imbalance lies in the digestive system and in the mind. After a visual diagnosis of my face, hands and tongue Tim diagnosed me as a Pitta/Vata. He provided me with a report of findings, below you will find excerpts from this document. Pitta: The balanced Pitta individual is blessed with a joyful disposition, a sharp intellect, and tremendous courage and drive. As the fire of the mind and body becomes unruly, however, the laughing Pitta quickly becomes the yelling Pitta. Anger, rage, and ego replace Pitta’s positive attributes, leaving an individual who is bitter with life and overbearing towards others. Vata: The balanced Vata individual is active, creative, and gifted with a natural ability to express and communicate. When the wind in a Vata type rages like a hurricane, negative qualities quickly overshadow these positive attributes. Common signs of Vata imbalance include anxiety and bodily disorders related to dryness, such as dry skin and constipation. Tim suggested I first focus on bringing balance to Vata, he indicated it was the first dosha out of balance and the easiest to bring balance back to. He stressed that it is essential to address vata at anytime we are making shifts in our lifestyle. Uh hello, that is exactly what I am doing! In addition to creating better sleep patterns Tim suggested I find peace and harmony in my home environment. He understood that I was currently without a home and indicated that this journey of mine was in direct conflict with what my balanced being needed. Sigh. I am not giving up this trip. If I need routine and a home it is going to have to come in the form of this blog and the people I am reconnecting with and meeting. One of my favorite findings in Ayurveda is that it is believed that my dosha explains my aptness to put on weight, to protect myself, I know it isn’t the only reason for my weight but it is nice to have an ancient medicine understand my struggles. I have a lot to learn about this ancient form of medicine before I fully understand my session with Tim but I am definitely interested in learning more, who doesn’t want to live a balanced life? Take a look at the following YouTube video to get a better idea of what Tim is doing at Wasatch Ayurveda. We didn’t have time to delve this deep during my visit but I have to say after watching this video I wish I had time for the full treatment.